When I was much younger I used to live and breath all things baseball. 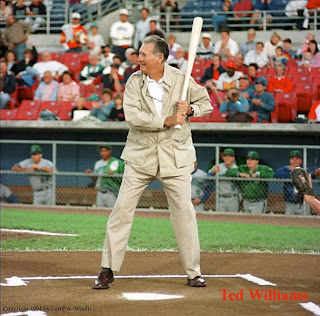 I connected with baseball because I loved the stories and the personalities of the game and now as I get older I realize I have a lot in common with Ted Williams. Ted has been decapitated and cryogenically frozen somewhere in Arizona….OK so maybe we are not that alike except for one thing. I always loved the story about Ted Williams and his lifelong dream to have people say to themselves as he left any room…. But to make this happen you are going to have to come and see me speak….and lucky for you I am going to be in the following cities between now and the end of the year. Montreal, Toronto, New York, Boston and Chicago. See below for more info and please please please support the fine people who have invited me to come and be with all of you! The amazing folks at Sprouter.com have invited me to speak in three cities with them in the next month with the first being in Montreal. If you are not familiar with Sprouter.com you should take a look as they are doing events geared to helping entrepreneurs as well as thier online collaberative tool that was just written up on Mashable.com Please RSVP if you can come out! I am super excited to speak at this conference as the majority of the attendees will be students either finishing up college/university or entering their last years. I will be speaking about Entrepreneurship and ask the students to look inside themselves and see if they have entrepreneurship characteristics in them and if they do I will advise them to drop out of school and start a company. Should be an interesting day! Details on this are still being worked out as far as content of my talk but I said yes without hesitation because I thing this will be an interesting group of folks to pal around with. Exactly a year (and a day) earlier than this talk I had the pleasure of speaking for MediaBistro on a Social Media panel with Tony Hsieh, Craig Newmark, Lynn Johnson, Jeff Howe and Thor Muller and I am overjoyed to be invited back for the sequel to that original talk. This time around the all female panel will be made up of myself, Valeria Maltoni, Amber Nasland and Shirley Bradley and I guarantee it will be informative and talked about to till at least the end of the year! I hope to see some of you at these events and as always I appreciate you sharing your time to read my blog.